My eight-year-old son Jayson is still in love with Richard. He calls Richard his best friend. Ever! Richard is a horse he met six months ago. After outfitting ourselves with boots, hats, and stampede strings at Boot Barn in Laramie, Wyoming, we drove twenty miles west onto US 130, unhitched ourselves from the minivan, and set up at The Vee Bar Ranch. Brent and Kelly, the husband and wife team that run the dude ranch, met us at the main lodge and showed us to our cabin on the bank of Little Laramie River. We unpacked and then uncoiled from the ride in the John Wayne saloon, playing pool and having a stiff drink. It’s an honesty bar, so when the bartender is not around you serve yourself and mark your tab. That’s how things work around here: self-sufficient, upstanding. Our sons met other kids and immediately had friends, moving from the pool table to board games to chasing one of the dogs lying in front of the saloon. Other guests recognized us as newcomers and stepped forward with and an extended hand. It a far ways from the big city and the East Coast standoffishness we were used to, that was clear. Later, we were called in for dinner at the lodge, tabled with Brent and a few of the wranglers. Steaks, biscuits, gravy, and a huge garden salad were rolled out like cowboy chow from central casting. The next morning, we sunscreened, saddled, and hit the trail. Our wrangler, Darcy, had a big hat and a bigger smile. She looked a bit like Kelly Ripa, if you fed her and gave her a lariat. Jayson, two days earlier, didn’t want anything to do with horses: He’d been on an infinity of effete circular pony rides on the East Coast, where the reins of near-dead beasts are nonetheless held by pony owners in fear of insurance claims. But today, he’s atop Richard, his own steed, on his own. Everything changes: He will want nothing more than to ride for the next week, just like the rest of us. We head off through the back gate into the big wide open. The Snowy Range mountains are in the distance, and the sky is painted a shade of blue I’ve never seen. We see antelope running ahead and avoid the holes dug by prairie dogs, as a bad step can break a horse’s leg. On other rides, we summit the butte, travel through mountainous terrain, herd cattle, and sing Western songs on a hayride and cookout. The few moments we weren’t in a saddle, we rode inner tubes down the river, soaked in an outdoor hot tub, shot clay pigeons, and helped feed and stable the horses. 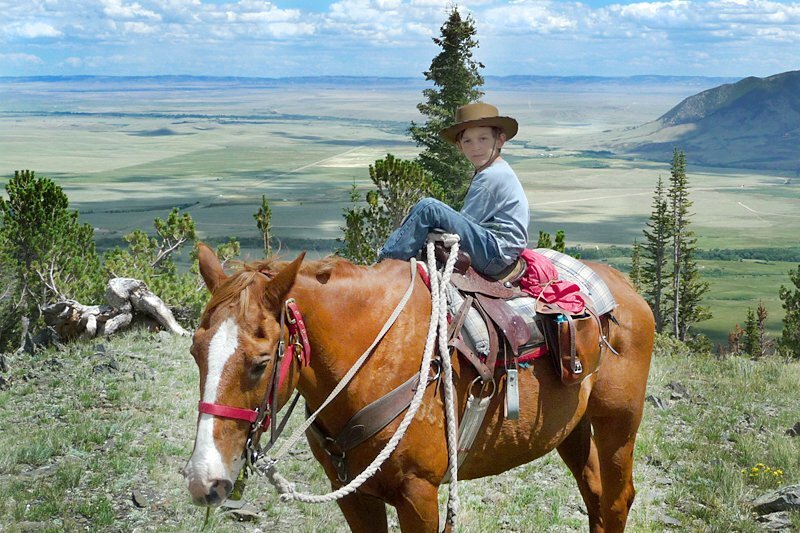 The Vee Bar Ranch is transformational, a superlative family vacation that is not easily described but best experienced atop a trusty steed.